Click the button below to add the Fossil Cheshire Cat Animated Watch Disney Limited Edition Li2543, NEW to your wish list. 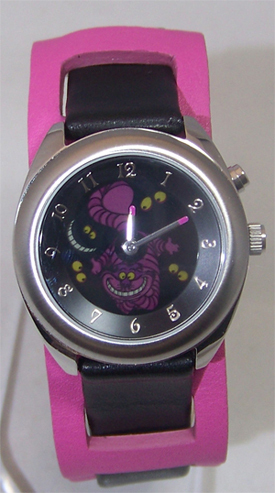 Fossil Animated Cheshire Cat Watch: New, unworn working, with tags and packaging. Fossil Li2743 in Mint Condition with tags and box. The cat sprints around the watch before disappearing down to its teeth then reemerging. You are purchasing a new, unworn watch in working condition with box and packaging and listed on multiple sites. It will be pulled from all sites once sold. Please note that the original Certificate of Authenticity is missing from this item. 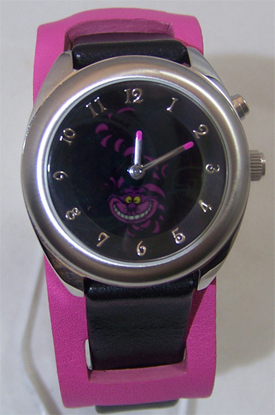 Ladies Fossil Limited Edition animated Cheshire Cat watch For Disney and Alice in Wonderland fans. 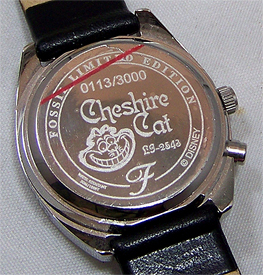 This animated watch shows the famous Cheshire cat sprinting around the dial then disappearing down to his teeth and reappearing on the black dial. You can also set the watch to stay on the cat image without animation. Case dimaeter 32mm, band width 16mm with wide cuff 26mm. Mineral crystal, two hand movement with analog plus kaleido animation display. The watch can also be worn with the black band without the pink wide cuff. This is an adult collectible watch, The animation is subtle in indoor light and gives the watch a more elegant adult look. Animation is more fully and brightly visible in outdoor sunlight. Round stainless steel case. Double leather wide cuff strap in pink and black. The watch and watch band are in new, unworn working condition. This is a rare sold out Fossil collectible wristwatch. Patented Fossil kaleido technology. . 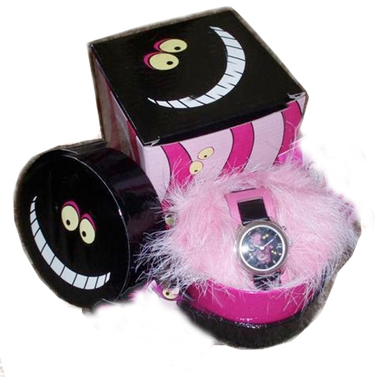 The special Cheshire Cat Fossil box with pink faux fur is included as is the outer cubed carddboard box however the Certificate of Authenticity is missing and has not been located at this time. Item will likely ship without it. Sold out Limited edition of 3,000 pieces.